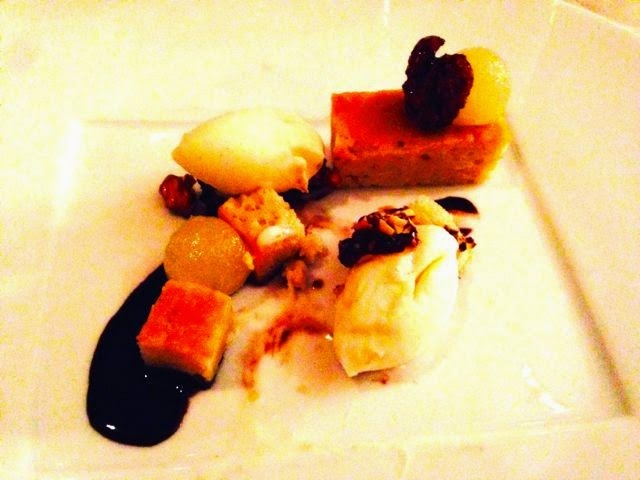 After having dined at Cityzen in 2012, I found myself comparing other restaurants to it time and time again as it set a high standard for what I expected in a fine dining establishment. 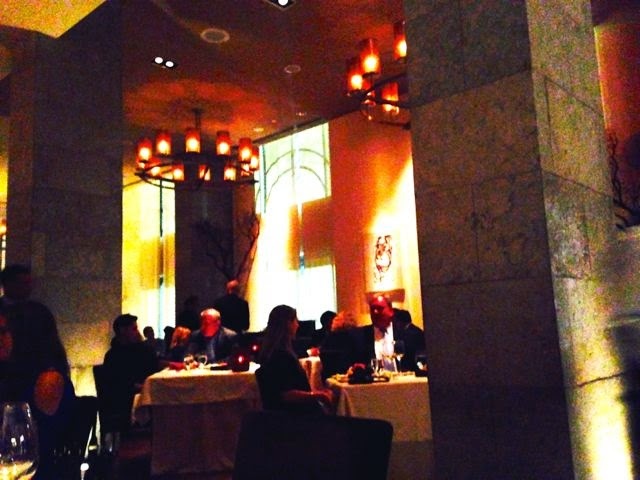 Eric Ziebold is the mastermind behind Cityzen located inside the beautiful Mandarin Oriental. 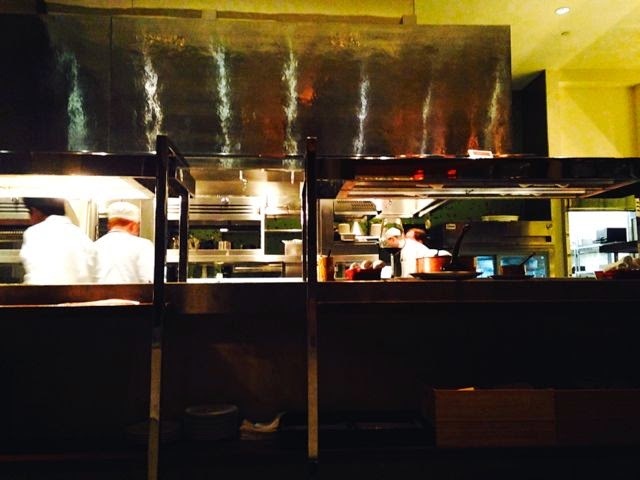 This well-acclaimed chef began his career at Vidalia in DC, then moved on to Spago in LA. After that he worked at the world renowned French Laundry in California, then Per Se in NYC. If that isn't one of the most impressive resumes you've ever seen, throw a James Beard award in on top of it and then I think you'll find that hard to top. So when Chris asked what I wanted to do for my birthday, my first thought was to go to Cityzen! After all, it has been two years and since then I've dined at Michelin-starred restaurants so I wanted to see if my first impression would remain. To be clear, Michelin does not come to DC, for whatever reason, because if they did, Cityzen would surely be rated. But, don't get me started on that. We were seated promptly at 7:30 p.m. on this Tuesday night. Shortly thereafter, I realized the memory card was not in my camera so I had to take photos on my iPhone and I'm apologizing upfront for the crappy photos I have posted here. Let's move on. We had informed the host when making the reservation several weeks ago that we'd be dining vegan. Then, I called to follow-up a week later and they confirmed the note. Two years ago, when I dined here, they were ready for me. The server was ready to explain how the vegetarian menu would be modified to be made vegan. This time, however, that was not the case. I was handed a menu and once I realized the server wasn't aware that we were dining vegan, I stopped him and let him know. I was trying to avoid the explanation of the many meat dishes. Did this deter him? Oh, no, not at all. He acknowledged my mention that I'd be dining vegan, then suggested we take a look at the menu anyway as if I'd have options to choose from. So, he continued his spiel of how you can choose from four-course prix fixe, six-course chef's tasting, or six-course vegetarian tasting all the while highlighting the meat and cheese. I was so perplexed. Was he wondering if perhaps I might change my mind this instant upon hearing that the crispy skin filet of Florida red snapper was available? I, again, reiterated that we'd be dining vegan and he seemed to get the point. I asked the sommelier to stop by and discuss the wine pairing as it related to the vegan menu. In the meantime, they put butter on the table. I inquired as to whether it was real butter, they confirmed, apologized, then removed it. I began wondering if this was the same Cityzen I had dined at a few years ago. At least when they returned with the bread basket, they informed me which bread was vegan so that was good. The sommelier informed me that the vegetarian menu was nearly vegan and that few substitutions would have be to be made so the wine pairing would be the same. That sounded great to me. The amuse bouche was some sort of croquette with a strong turmeric taste to it -- soft on the inside and crusty on the outside. What a great way to start the meal! The pairing was a Prosecco with pomegranate syrup and it was so delicious. 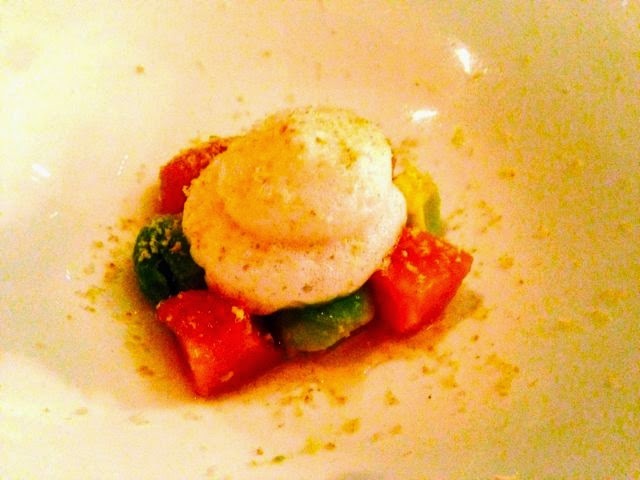 The first course was marinated avocado and toasted hazelnuts with a coriander mousse and peaches. The pairing was a Reisling from Germany. It was pretty good, but I liked the amuse bouche better thus far. The second course was the Cityzen succotash. I absolutely loved the complexity of this dish. 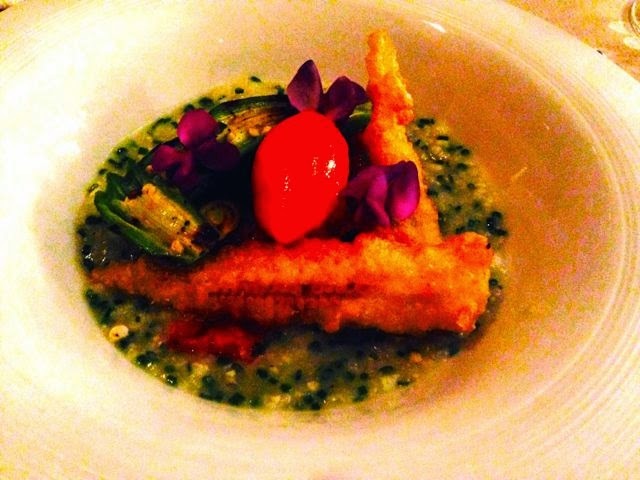 Spiced okra and tempura baby corn was placed atop a corn grit coulis. In the middle, red pepper sorbet with hyacinth blossoms became the centerpiece of the meal. For creativity, I give this dish a 10. Tempura baby corn with red pepper sorbet in a savory dish? It worked and it worked well! Definitely one of the highlights of the night. 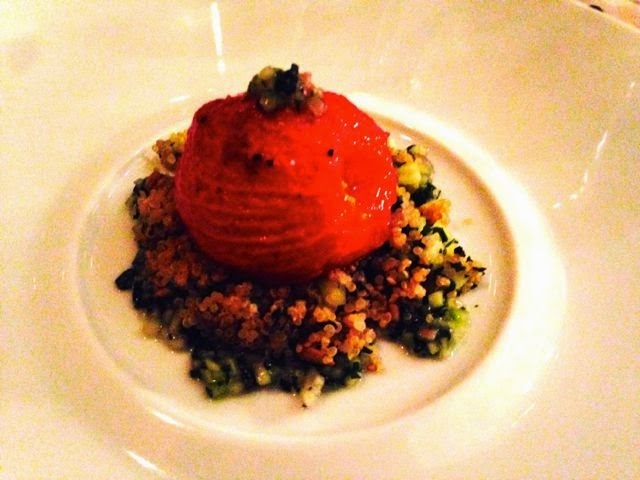 The third course was a slow baked roma tomato with the skin removed atop quinoa with toasted sunflower seeds and English cucumber with a mint vinegar dressing. Very creative. 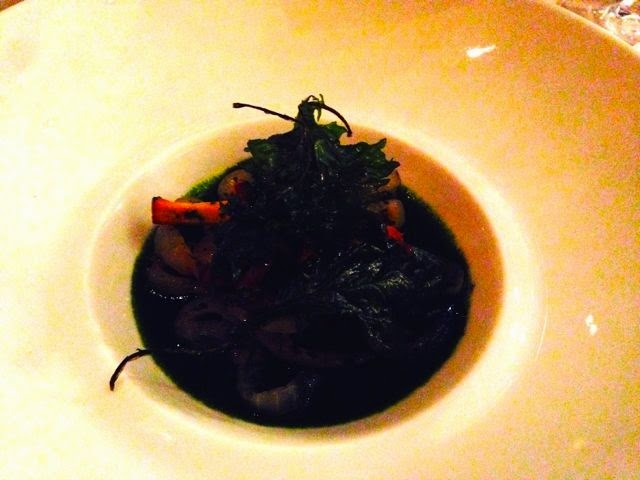 The fourth course was roasted chanterelle mushrooms with walla walla onions with anise hyssop and anise puree. It was very good and the Melini Chianti (1999) was one of my favorite wines of the night. 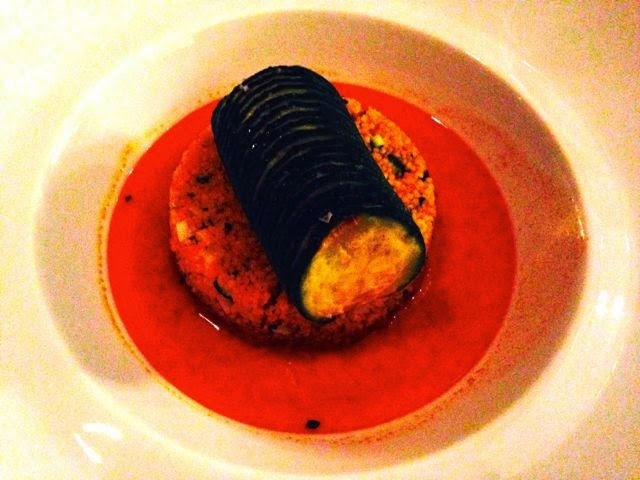 The fifth dish was the scalloped zucchini couscous with pimenton dulce sauce. I think this was my least favorite dish of the night as I found the zucchini to be quite plain. 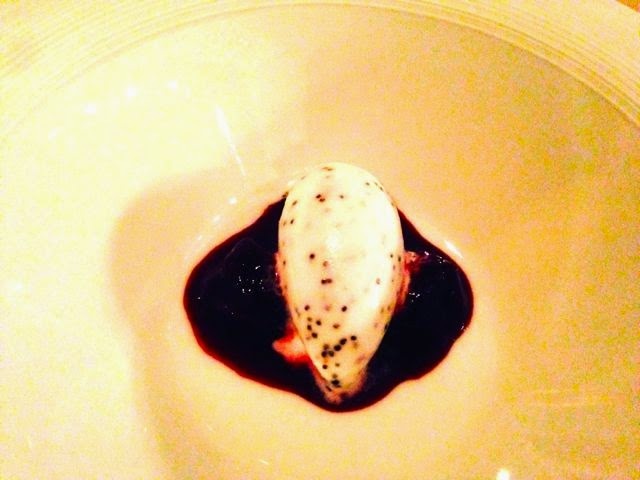 The intermezzo was a poppyseed sorbet over a blueberry compote. Yum. Finally, to end a wonderful evening, we were served a vegan cake with poached pear, chocolate sauce, and vanilla ice cream. It was spectacular. 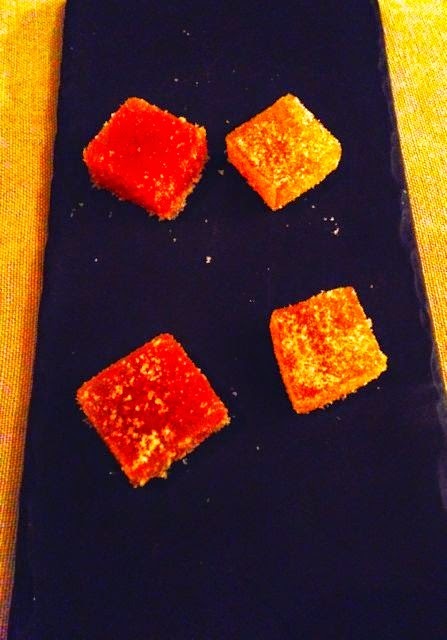 The final offering was a petit fours made with ginger and lychee. If I go over the night in my head and I think about the highlight, it was probably the fantastic wine selection. Every wine was very good and made an excellent pairing with the dishes. But, really the food was spectacular as well. I didn't love every single dish, but all of them were beautifully plated and thoughtfully put together. 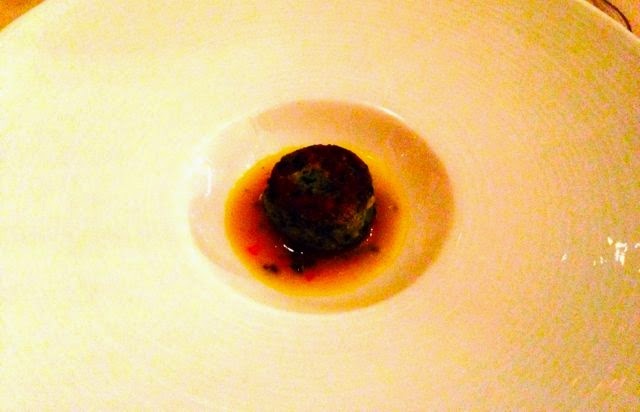 And I did love many of the dishes so Eric Ziebold continues to impress. The service was very good throughout the night, but the only thing that bothers me was my server's behavior when we first arrived. If you have a diner with specific dietary needs, you should be sensitive to that, especially at a fine restaurant. In the end, I thought the food was great, the wine was fantastic, and the service overall was so-so. The price was fair as well at $110 per person plus $85 for the pairing. I wasn't as impressed as the first time I visited, but Cityzen still remains one of my favorite spots in DC. I look forward to dining with them again in the future.